What’s one of the best things about life in 417-land? Lake life in 417-land, of course. 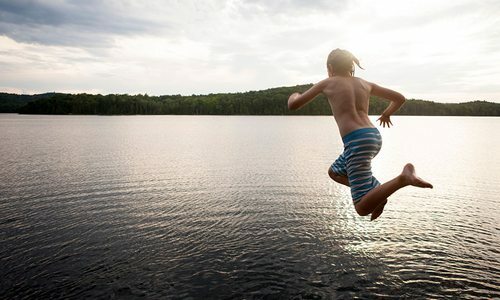 There are so many options for splish-splashing fun in our region, we just couldn’t resist compiling them all into this handy lake-by-lake guide. The best part is what’s in it for you: Options for exploration. Maybe you have a favorite lake—one that you visit over and over again. Maybe that’s because of longstanding family traditions or simple proximity. We hope this lakes guide opens your eyes to the fun to be had at all of southwest Missouri’s watery wonders. 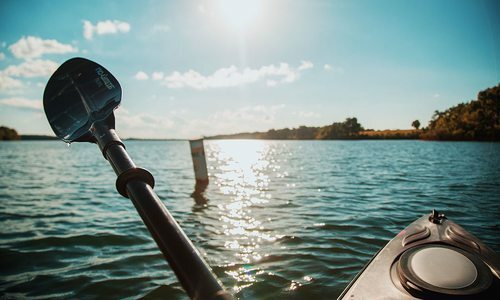 Whether you’re an angler, a swimmer, a skier or just someone who enjoys a great view, read on to find the lake activity that’s just right for you. Ah, Table Rock Lake. This spot is a gem for folks in and around the Springfield area, but that wasn’t always the case. In fact, it has only been here 54 years. It all started in 1958, when the U.S. Army Corps of Engineers dammed the White River, to create what is now Table Rock Lake. Today, the Corps still manages Table Rock Dam and the lake. The hundreds of miles of shoreline and thousands of acres of pristine water provide a natural playground that lies practically in your very own backyard. 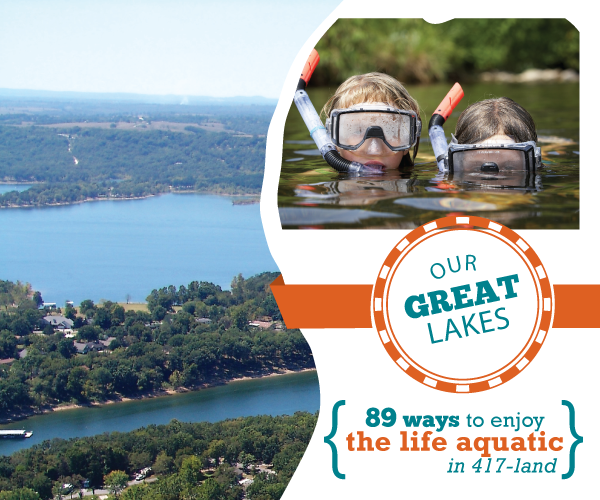 Plus, the lake is just minutes from all the fun Branson has to offer. 1. 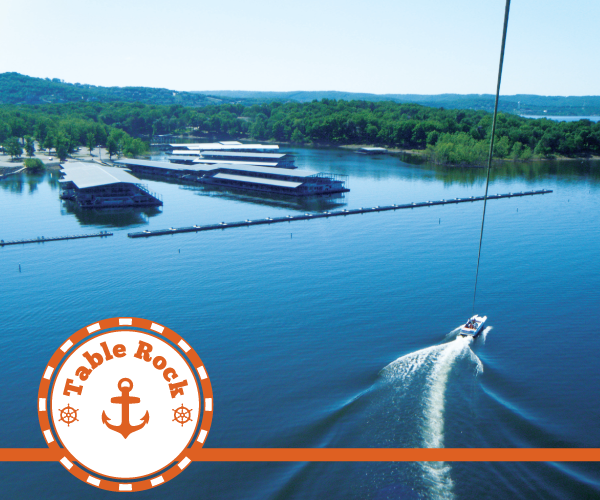 A ride to the top of Inspiration Tower at Shepherd of the Hills gives you one of the best aerial vistas of Table Rock Lake, as well as the beautiful Ozark Mountains around it. Ride up in a glass elevator, then walk down one flight of stairs to an open-air deck, where you can take a closer look through a telescope. The tower is open seven days a week, year-round (weather permitting). 2. If roller coasters are your thing, don’t miss Wildfire at Silver Dollar City. This thriller-of-a-ride reaches speeds up to 66 miles per hour and puts you high above the tree tops, giving you a breathtaking—or, perhaps, take-your-breath-away—view of the lake. 3. For a true aerial view of the lake, contact Chopper Charters. This helicopter charter company offers several different tour options, but the Encore tour at $124.95 per person gives you a 20-minute ride over Table Rock Lake. That’s plenty of time to capture some amazing photographs. 4. Go parasailing! State Park Marina offers parasailing for $79 per person and can take up to six people per trip. The boat leaves every hour on the hour. Call ahead to make reservations (417-334-2628). Big Cedar Lodge is still one of the most beautiful settings in 417-land, especially in the summertime. There are so many ways to customize your stay, from romance and spa packages to culinary tours and hiking adventures in Dogwood Canyon. This summer, ask about the Lakeside Getaway that includes two nights in one of Big Cedar’s many lodging options, a four-hour party barge and tube rental, a four-hour deck boat rental, a jet ski or wakeboard rental and a cooler full of drinks and snacks. Big Cedar also offers boat rentals, fishing guides, paddle board rentals and even ski school. If you prefer a comfortable (read: luxurious) stay but want plenty of outdoor activities to keep you busy, the vacation spot for you may be Stonewater Cove. Nestled in the Mark Twain National Forest, Stonewater Cove is a unique all-inclusive resort. Cost is $600 per person ($400 for additional person in same room) per night and includes most all activities on the property: ATV rides, zip lining, boating, water sports, hiking, hunting and fishing. Meals are also included. Extras not included in the rate are spa services and guided fishing trips. Still Waters Resort offers all sorts of family activities—many of them free to guests—and it’s just minutes from the Branson Strip and Silver Dollar City. Choose from motel rooms, condos and even a lakefront house as your home away from home. There are three pools, three hot tubs and two kiddie pools, a game room, a playground, sand volleyball, barbecue grills and picnic tables, hiking trails, plus free paddleboats, kayaks, bikes and a water slide. Boat and jet ski rentals are also available. Chateau on the Lake will always be one of Branson’s most romantic hideaways. Request a lakefront room, so you can keep the sparkling waters of Table Rock Lake in view during your stay. Start your morning with a yoga session in the lakeview studio. Chateau has its own full-service marina that offers boat rentals and nightly slip rentals (if you have your own) for boats up to 70 feet. Paddleboats, kayaks and canoes can be used by guests free of charge. Parasailing, scuba diving, fishing guides and equipment rental, as well as a marina store, are also available. After a day of fun and sun on the lake, relax with one of Chateau’s many spa treatment options. If you’re a family traveling with another family (or two), or several couples, or perhaps a business retreat… you may be more comfortable and have more fun in one big house. The Alpine Summit Lodge (314-495-9610) in Hollister has six bedrooms plus sleeper sofas and sleeps up to 18. The Great Elk Lodge (417-839-7900) in Kimberling City also has six bedrooms and sleeps up to 24. But there are more houses to choose from if you know where to look. Visit Vacation Rentals By Owners (vrbo.com) and search “Table Rock Lake” to search specific areas and house sizes. One of the reasons so many flock to Table Rock Lake each year is the excellent scuba diving. The visibility is good most of the time (10 to 12 feet or so), the water is warm in the summertime (average in the mid-80 degrees), and there are fish and other interesting things to see down there. There’s a sunken cabin cruiser in about 45 feet of water at Jake’s Island near Indian Point. Another popular spot is Enchanted Forest—an underwater grove of cedar and oak trees—directly north of the dam on the east side of the lake. Don’t forget your flashlight. Even if you aren’t a certified diver, you can still experience diving without spending too much money. DiVentures offers a Try Scuba course for $60, and you get to spend about an hour and a half in the pool with an instructor. State Park Marina offers a Discover Scuba course for $89 per person at 9 a.m. and 1 p.m. every day in the summertime. This class actually gets you out on the lake. The destination is typically Duck Island, where you can stand in shallow water until you feel comfortable in your gear, and you can feed the fish right out of your hand! Both DiVentures and State Park Marina offer scuba certification courses as well as dive trips to places like Cozumel, Bonaire and the Bahamas. There are plenty of water sports to be had on Table Rock Lake, and you can almost always find a quiet cove away from boat traffic to enjoy skiing, tubing, kneeboarding, wakeboarding and parasailing. Most marinas on the lake offer some ski and board rentals as well as sales. The Mastercraft Pro Wakeboard Tour is coming to Table Rock June 8–9. Some of the best riders in the world will compete in front of Moonshine Beach. Visit kingofwake.com or call Williams Brothers Ski and Sports at 417-858-6366. Ask about wakeboarding lessons, too. Big Cedar Lodge also offers a professional ski school during the summer months. 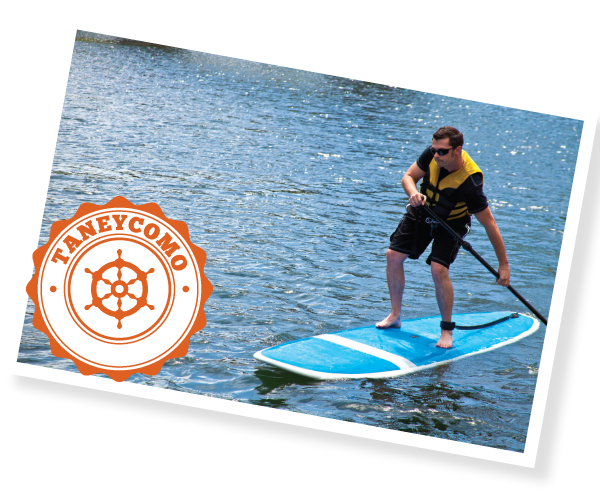 The cost is $150 for up to six people and includes the instructor’s time, tournament ski boat and equipment. Fuel is extra. Reservations are recommended; call 417-335-2777. There are a few things you should know before letting a rope (and a person) out behind your boat. There must be an observer in addition to the boat driver to keep watch over the person being towed. Or you can use an approved ski mirror; however, ski mirrors are not approved on jet skis. Also, you must signal with an orange skier-down flag when the person you’re towing falls into the water. You can lower the flag when the boat is in motion. Pulling towables is only allowed during daylight hours. Jet ski rentals are readily available at several marinas and resorts on Table Rock Lake, including but not limited to Indian Point Marina, State Park Marina, Cape Fair Marina, Port of Kimberling Marina and Double Oak Resort. Note: It is Missouri law that if you were born after Jan. 1, 1984, you must carry a boating safety identification card, issued by the Missouri Water Patrol, if you plan to drive a boat or personal watercraft. Visit mswp.dps.mo.gov to learn more. Want to go boating with a big group? Five Star Houseboat Vacations is in their third season on Table Rock Lake. The six boats are docked at Port of Kimberling Marina. The largest sleeps up to 14 people. Captains drive the boats in and out of the marina and train you to drive out on the lake. Call 417-988-1387 or visit tablerockhouseboatrentals.com. This 70-minute Ride the Ducks excursion starts on land and ends up in Table Rock Lake. The captain plays music and provides a history lesson and will even let you take the wheel if you wish. This is fun for the whole family—and it doesn’t cost very much money. Family four-packs are available for $54 plus tax. Call 877-887-8225 for tickets. Visit branson.ridetheducks.com for more details. The Showboat Branson Belle offers up to three cruises per day in the summertime: noon, 4 p.m. and 8 p.m. Cruises last two hours, and all sorts of packages and special events are offered throughout the season. Visit showboatbransonbelle.com for more information. Climb aboard the Spirit of America, a 48-foot catamaran docked at State Park Marina. The boat leaves at noon, 2 p.m. and dusk (for a sunset sail) each day. Cost is $24.95 per person for adults, $14.95 for kids 12 and younger, and free for kids 4 and younger. If you’ve always wanted to learn to sail, you can help the crew sail the vessel, or simply sit back and enjoy the ride. The boat handles up to 49 passengers, so it’s great for large groups. Ask about the swim cruise: The captain brings a giant floating trampoline, inflatable slide and two kayaks. Guests are welcome to bring coolers with their own snacks and drinks (including beer). Reservations are recommended. Call 417-334-2628, or visit stateparkmarina.com for more information. The newly remodeled Dewey Short Visitors Center (4600 State Highway 165, Branson, 417-334-6394) is a great day-trip in and of itself. But while you’re there, be sure to take advantage of the Table Rock Dam Tours. The fascinating tours actually take visitors inside the dam. Pretty neat! Tickets for the dam tours are $14.50 for adults and $8 for children ages 6 to 11. Children younger than 6 are not admitted to the dam. You can even book your tickets online in advance at tablerockdamtours.com. 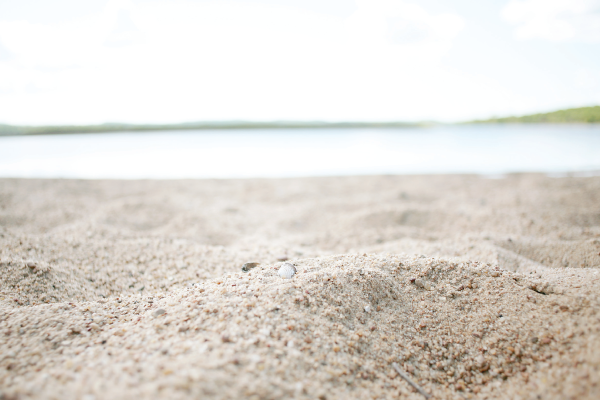 Even in land-locked 417-land, you can still sink your toes in the sand at Moonshine Beach, located on the north end of Table Rock Dam on Highway 165. This Corps of Engineers park is the only sandy beach on the lake. It’s open from 9 a.m. to 9 p.m. during the summer (sorry, no overnight camping), and there is a daily use fee of $4 per vehicle. In addition to a swimming area, there is a sand volleyball court, launch ramp, courtesy dock, picnic areas, playground, showers and restroom facilities. Moonshine Beach is open through September 15. Like its sister lakes, Table Rock and Bull Shoals, Taneycomo was originally part of the White River. Yet it’s the only one in the chain that still looks and feels like a river. Its water comes from the bottom of Table Rock Lake, and the average temperature is less than 60 degrees, making it a bit chilly for swimming, even in the summertime. But the fishing is world-class. 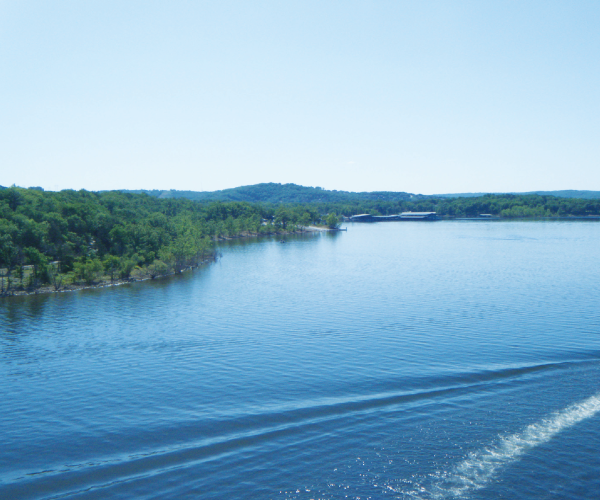 Millions of travelers visit Branson each year, and fishing Lake Taneycomo is often on many of their itineraries. The lake is stocked with about 750,000 trout each year, so you ought to catch a fish or two. There’s a lot to love about this chilly little lake. Read on, for five great ideas to motivate your adventurous spirit. Taneycomo is a phenomenal trout-fishing lake. Don’t know the first thing about trout fishing? Not a problem. 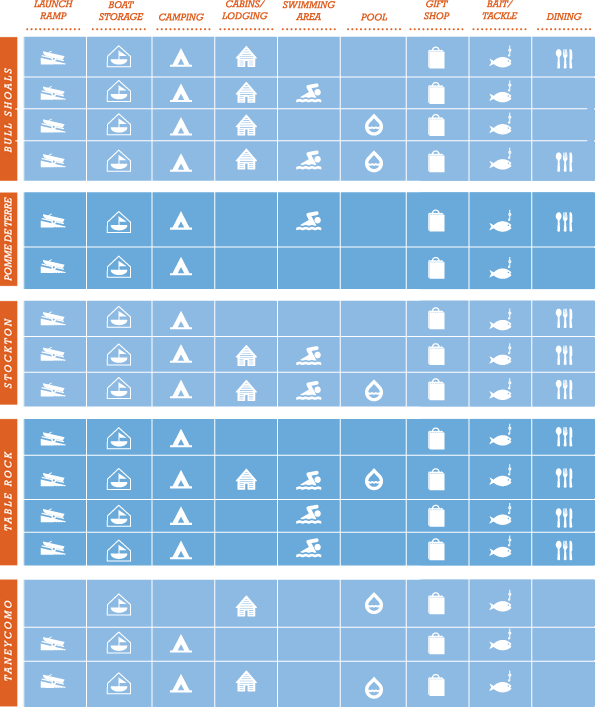 There are plenty of guides and outfitters to show you everything you need to know. River Run Outfitters has seven experienced guides, equipment rental and even cabins for rent. Call about the upcoming fly-fishing clinic on June 16. Cost is $80 per person. For those looking to fish by moonlight, Taneycomo Trout Fly Fishing Guide Service offers day and night guided trips. Want to see how the professionals do it? Book a trip with professional fisherman and guide John Sappington. He guarantees you’ll catch fish. Don’t forget to get your Missouri fishing license ($12 annually for residents) and a trout stamp ($7 for adults and $3.50 for kids younger than 16). Located about six miles south of Branson on Highway 165 below the Table Rock dam, this hatchery is the largest trout production facility in the Missouri Department of Conservation trout production program. It supplies about two-thirds (roughly 500,000) of the trout that are stocked in Taneycomo each year. Hatchery tours are offered at 10 and 11 a.m., 1 and 2 p.m. weekdays from Memorial Day to Labor Day. Call 417-334-4865 for more information. There’s a cruise for just about every personality at Main Street Lake Cruises. Departing from Branson Landing and traveling along Lake Taneycomo are historic paddleboat and luxury yacht cruises with a variety of themes: sightseeing, breakfast, birthday, brunch, moonlight and more. There’s even a Paddlewheel Pizza Cruise! Pizza buffet with a view? Yes, please. There are a few great options for lakeside lodging, especially if you like a not-too-expensive cabin stay. Cooper Creek Resort and Campground is located right on the lake shore and offers non-smoking cabins with full kitchens starting at just $75 per night, campsites and 75 full RV hook-ups. Bring your own boat and dock it there or rent a boat. Kids will enjoy catching trout right off the dock. Lilley’s Landing also has lakefront (and some off-lake) cabins with full kitchens—some have up to four bedrooms. There’s a pool on site as well as a marina and tackle store. Lilley’s Landing also offers guided fishing trips. Lazy Valley Resort is located about a mile and a half off the Branson Strip. One-bedroom units start at $67 per night for two people. They also offer guided fishing trips and have a pool and fishing dock on site. Pomme de Terre Lake is located about 50 miles north of Springfield near Hermitage and Pittsburg. 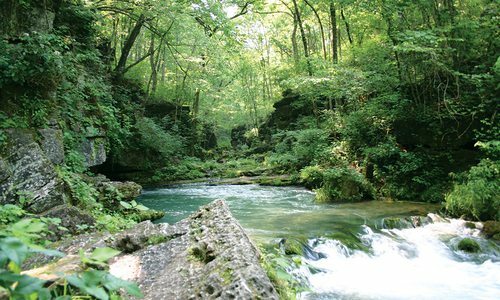 It was created in 1961 and is a part of the Pomme de Terre River system. Like many other Corps of Engineers projects, Pomme de Terre was built for flood control. At normal pool it covers about 7,800 surface acres, but it can more than double in size when it reaches flood level. It’s a popular lake for fishing and is especially well-known for muskie fishing. There are only four marinas on the lake: one in Hermitage, one in Flemington and two in Pittsburg. Drop a line for muskie, Pomme de Terre Lake’s signature fish. Boating, swimming and camping bring folks to Pomme de Terre every year, but fishing has the biggest draw. You can catch bass, walleye, catfish and crappie, but it’s the muskie fishing that makes it unique. Pomme de Terre is the leading muskie fishing lake in the midwest. Muskie (short for muskellunge) do not reproduce naturally, so they are stocked annually in the lake. Muskie are at the top of the food chain. They have a mouth full of sharp teeth and grow to well over 36 inches—the length limit for keeping a muskie. Muskie fishing isn’t easy. In fact, some folks say you have to work really hard to catch one, and sometimes you won’t catch anything. 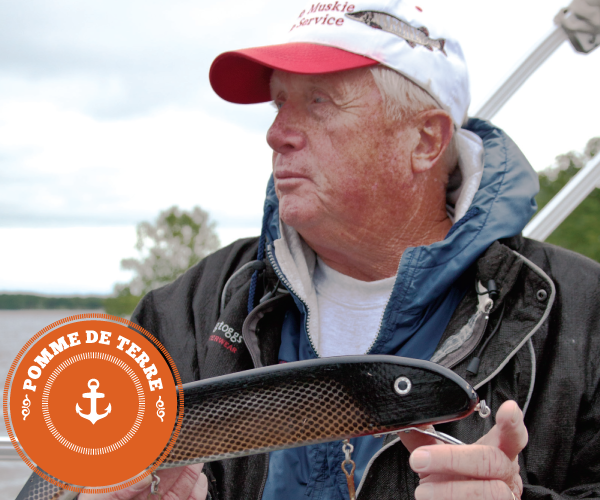 According to Earle Hammond, a guide on Pomme de Terre, muskie aren’t afraid of anything. They’ll swim right up to the boat and grab the bait. Hammond practices catch and release when he fishes and says he’s even caught the same muskie twice! Hammond operates Pomme Muskie Guide Service and offers half-day and full-day guided trips on Pomme de Terre. Hammond also guides for bass and walleye in the summertime. Bowfishing is gaining in popularity on area lakes, too. Dan Swearingin, the owner and editor of The Bowfisher Magazine, has a guide service on Pomme de Terre. Bowfishing is pretty much what it sounds like: Instead of using a rod and reel to catch fish, you use a bow to shoot the fish. The type of fish you can shoot varies from lake to lake, but typically only rough fish (carp, gar, buffalo) are allowed. Swearingin offers day and night trips on Pomme de Terre for $200 per person. All equipment, snacks and drinks are included. He can take up to four shooters on his boat, so it’s a great activity for the whole family. Kids as young as 9 can learn how to bowfish. (Any younger, and they usually aren’t strong enough to handle a bow.) You don’t need experience with fishing or with archery—Dan will show you everything you need to know and fit you with the proper gear before heading out on the water. Call 417-399-1480 or visit thebowfisher.com. The last and the largest lake in the White River system, Bull Shoals Lake stretches from Forsyth in central Taney County through Ozark County all the way to southeastern Marion County in Arkansas. You can boat from Forsyth to Bull Shoals, Arkansas, and rack up about 80 miles on your boat’s odometer—and that’s just one-way. Last year Bull Shoals reached a record 42 feet above normal when torrential downpours in April flooded most of the region. Because it can fluctuate so much, Bull Shoals’ shoreline is undeveloped, allowing it to remain one of the most beautiful, undiscovered lakes in our region. Bull Shoals is one of the best lakes for diving in the region. There are countless bluffs and rock ledges that provide excellent homes for giant catfish. Bull Shoals Lake Boat Dock offers scuba certification courses, guided dive trips and scuba equipment rentals. Call 870-445-4424 or visit bullshoalslakeboatdock.com for a list of popular dive sites. It’s clean, it’s clear, and it’s safe for swimming. A lot of folks anchor in Hollingsworth Cove between Pontiac and Oakland, as well as Music Creek, near Point 17. For a refreshing swim, travel as far west as you can go on Bull Shoals to Powersite Dam in Forsyth (usually only reachable when the lake level is above normal). There you’ll find the water is much cooler, as it’s coming straight out of Taneycomo. Several parks have designated swimming areas, including Buck Creek, Highway 125, Lakeview, Lead Hill, Oakland, Point Return and Theodosia. Day use fees of $1 per person and $4 per car are charged for those areas. Keep this in mind next time you’re wishing for the lake in the middle of winter: Every January, about 100 bald eagles migrate to the Bull Shoals Lake area, and the Bull Shoals–White River State Park hosts an eagle awareness weekend. Guest speakers, live bird demonstrations and live entertainment are free to the public. Guided lake and river tours are also on the agenda for a fee. Call 870-445-3629 or visit arkansasstateparks.com/bullshoalswhiteriver. The past two years, Bull Shoals Lake played host to BroStock, a professional wakeboarding competition. Thousands of fans came by boat to watch the competition. BroStock brings with it quite the party, which proved to be a little much for the quieter, more laid-back Bull Shoals. So this year the pros are headed to Lake of the Ozarks. However, the sport continues to grow in popularity on Bull Shoals, and just about every marina sells or rents boards if you’re interested in giving it a try. 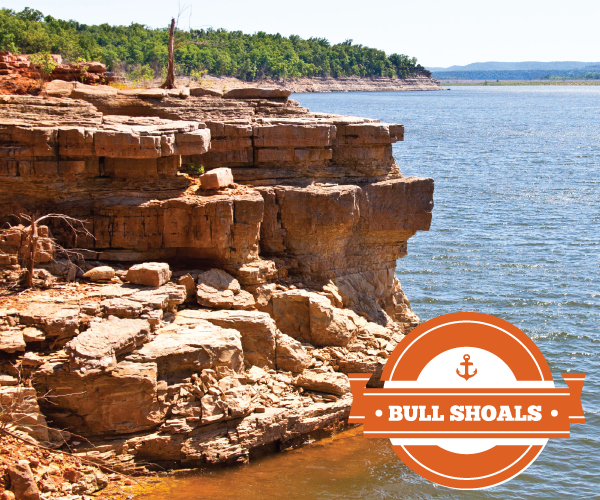 Bull Shoals is paradise for boaters who enjoy a gorgeous view and appreciate an undeveloped shoreline. Because Bull Shoals water levels can fluctuate so tremendously, the shoreline is managed by the Corps of Engineers and remains untouched. There are plenty of activities to enjoy on Bull Shoals, but it isn’t so crowded that you can’t find seclusion, even on busy holiday weekends. Bull Shoals Lake Resort (bullshoalslakeresort.com) is one of the largest resorts on Bull Shoals Lake, making it a great spot for family reunions or large retreats. The resort has two swimming pools and offers boat rentals, too. Brand new this year is Lake Harbour Resort at Pontiac Cove. King and queen suites overlook the lake and are within walking distance of Pontiac Cove Marina. Just Jackie’s restaurant at Pontiac Cove (417-679-2593) just celebrated 10 years in business. People can’t stop raving about her thin-crust pizza. She also serves a full menu (breakfast, lunch and dinner), plus beer and wine daily in the summertime. Gaston’s overlooks the White River; however, you can get there from Lakeview Cove Marina. Park your boat there, and the folks at Gaston’s will pick you up. For comfort food, make a run to Cookie’s at Theodosia Marina. They serve breakfast until noon and biscuits and gravy all day. Don’t miss the prime rib Friday and Saturday nights, and be sure to save room for a brownie pie. Pontiac Cove Marina hosts the first on June 16. Divers take off from Pontiac Cove, and the weigh-in is held at Hollingsworth Cove in Arkansas. (It’s illegal to bring speared catfish and walleye into Missouri; however, it is legal to spear them in Arkansas.) Spectators can watch the weigh-in from 1 to 3 p.m. by boat or by land. Call 417-679-3676 for more information. DiVentures in Springfield is sponsoring a second tournament July 21 out of Lead Hill. Flathead (catfish) season opens July 15, so divers will be able to spear flatheads in this tournament. If you aren’t looking for it, you’ll miss it—and even if you are looking for it, you still might miss it. Tucked away on the west side of the lake between points 17 and 18, Secret Cove (or Hidden Cove, as it’s sometimes called) is a narrow, shallow winding cove that extends about half a mile back from the main lake. It’s lined on both sides by steep rock bluffs. At the very back of the cove you can hike up to find a smooth, concave rock formation in the shape of a bathtub. One good reason to visit the James A. Gaston Visitor Center is for the view. The facility offers a spectacular view of the dam, Bull Shoals Lake and the White River. Inside there is a theater, exhibit hall, observation tower and gift shop. Buzzard’s Bluff is one of the tallest and most picturesque bluffs on Bull Shoals Lake. Situated just into Arkansas near Oakland Marina, Buzzard’s Bluff is also a popular dive site. A few brave souls have jumped from this cliff, but it is definitely not recommended or considered safe for jumping. You can hike out to this spot (take Highway 5 south to Highway W, through the Pontiac area to the very end of the road; park your car, and start walking) and capture some amazing photos of the widest part of the lake: Yocum Bend. Bull Shoals Lake Boat Dock and Highway 125 Marina rent houseboats on Bull Shoals Lake. Larger groups will like the 60-footers at Bull Shoals Boat Dock—they sleep up to 14! Don’t have experience driving one of these massive boats? No worries. The folks at BSBD will go over a thorough checkout procedure before sending you off. Call 870-445-4424 or visit bullshoalslakeboatdock.com. Highway 125 Marina rents 36-foot themed houseboats, from Jimmy Buffett to NASCAR. Call 870-436-5390 or visit 125marina.com. 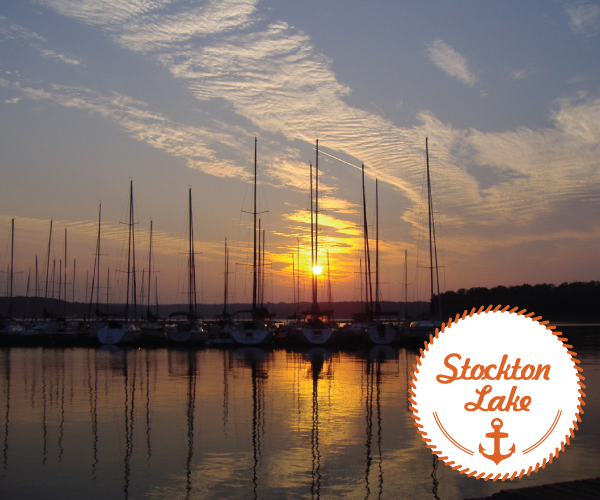 Stockton Lake is one of the top 10 sailing lakes in the country. There are sailboat races and even a world-renowned sailing school. There’s no denying the open countryside surrounding the lake makes for excellent sailing conditions, and folks have been taking advantage of the prevailing southwest winds since the lake was formed in the late ’60s. But, don’t let that fool you. Sailing isn’t the only activity folks enjoy at Stockton. There is plenty of pleasure boating, swimming, water sports and fishing to be had. Stockton is known as “the sailing lake” in our region. It is, in fact, one of the top 10 best sailing lakes in the country. The topography of the lake allows a consistent southwest wind to blow in from Oklahoma and Kansas, making for excellent sailing conditions most of the time. Races are hosted throughout the year by the Lake Stockton Yacht Club. Anyone can join the club—you don’t have to be a sailor or own a sailboat to be a member. If you’re interested in learning more about sailing, it’s a great way to meet others already in the sport—and Commodore Brian Wampler says some members with sailboats are happy to take out new members to show them the ropes. Memberships are $60 annually. Email wampler1980@hotmail.com for more information. The yacht club is a great way to meet other people who enjoy sailing, but if you want to become a certified sailor, there is a world-renowned sailing school right on Stockton Lake. The instructor, Larry Strait, is based out of Stockton State Park Marina. He was voted outstanding sailing instructor last year and two years before that by the American Sailing Association. He offers classes for one or two people from mid-May through mid-October and says September is often the best sailing month on Stockton Lake. The most popular course is the basic three-day sailing course, which certifies you to charter a boat or sail by yourself. Cost is $595 for one person; $495 each for two people. Call 417-859-5655 for more details or to set up a class. 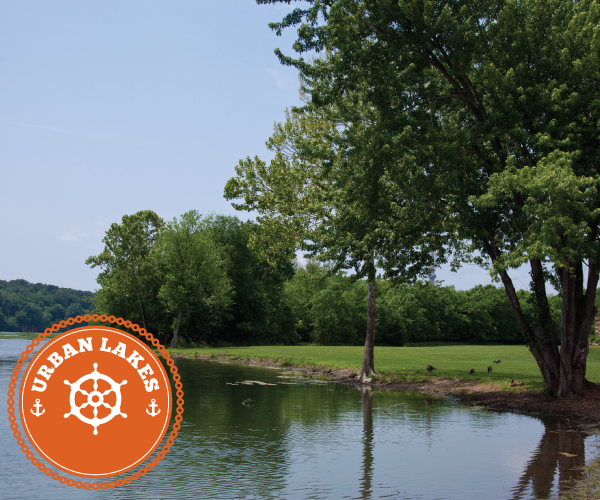 There are three marinas on the lake: Mutton Creek Marina, State Park Marina and Orleans Trail Marina. Sailboats are docked at all three marinas, but the majority of them are at State Park Marina (about 150) and Orleans Trail Marina (about 300). 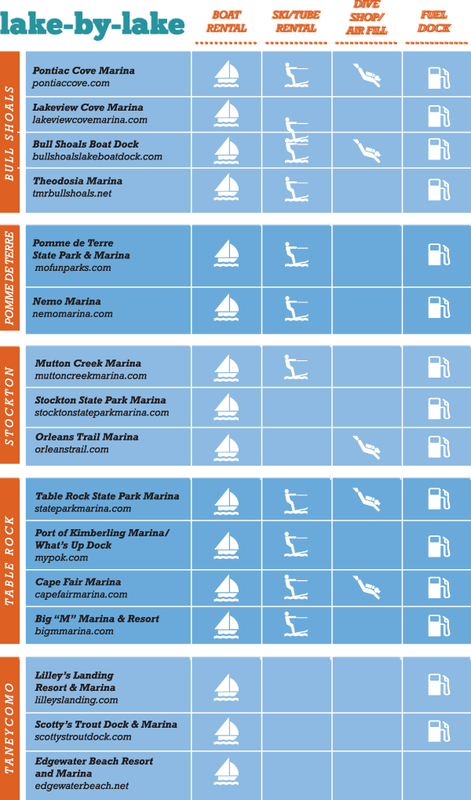 All three marinas rent pontoons and fishing boats; State Park Marina also rents sailboats, but you must be ASA-certified to rent one. All three marinas have restaurants either on the water or within walking distance: No Wake Café at Mutton Creek is the only floating restaurant on the lake. Fishing is a popular pastime on Stockton, and folks can catch anything from smallmouth and largemouth bass to crappie, bluegill and catfish. Stockton is known for walleye fishing, but walleye aren’t always the easiest fish to catch, so the folks at State Park Marina suggest hiring a guide. Here are two: Steve Gregg with Whitecap Guide Service or Bob Bennett. Lake Springfield is located on the James River next to the James River Power Plant, near Highways 60 and 65. It’s operated by the Springfield–Greene County Park Board, and its water is managed by City Utilities. During the summer months the lake is open from 9 a.m. to 6 p.m. Monday through Saturday; 11 a.m. to 6 p.m. on Sunday. Motor boats are allowed on the lake, but only up to 6 horsepower. The lake is very shallow in places, so be extra careful if you are on the lake in a boat. The parking lots are open 24 hours. Night fishing is allowed from the shore. Lake Springfield Boathouse and Marina offers canoe and kayak rentals, restrooms, snacks, drinks, ice, bait and tackle, and fishing and hunting licenses. Pavilions are available for family picnics and events, and the Boathouse Community Room is available year-round for private functions (weddings, retreats, reunions and birthday parties). It seats up to 80 and has a full kitchen and a 1,450-square-foot deck. Call the Park Board at 417-864-1049 or the Boathouse at 417-891-1550 or visit parkboard.org for more information. Fellows Lake is a water supply reservoir owned by City Utilities. It’s located north of Springfield near Highways 65 and AA, and at about 820 acres it’s the largest of the urban lakes. Motor boats up to 40 horsepower are allowed on the lake, as well as canoes, kayaks, paddleboats and sailboats; however, permits are required and can be purchased at Fellows Lake Marina for $35 annually. New marina owners Pam and Paul Price have updated the facility with fresh paint and new rental canoes, fishing motor boats, kayaks, rowboats, a bass boat and a pontoon. The couple also sells lures for catching huge muskellunge, and they have plans to bring in sailing instructors soon. Call the marina at 417-833-2058 for more information. Water skiing is allowed through Oct. 1 in designated areas and at designated times. There is a public boat ramp and courtesy dock for launching, as well as picnic areas and pavilions, playground equipment, a fishing dock and hiking trails. McDaniel Lake is located north of Springfield on the Little Sac River and can be accessed by road in just two places: Farm Roads 145/151 and a smaller crossing on Farm Road 159. The lake is owned by City Utilities and is part of the public water supply for the City of Springfield. It’s a restricted use lake—no boating, skiing, swimming or wading is allowed. Fishing from the shore is allowed upstream from Grant Street Bridge. Folks can catch smallmouth and largemouth bass, white bass, catfish, sunfish and carp. There are no facilities here. Until recently, fishing had been suspended on the lake at Valley Water Mill Park while repairs and renovations were made to the dam and the lake itself. In 2008 the lake was restocked with fish, and it just re-opened to the public for fishing this spring. It’s located on Valley Water Mill Road and is operated by the Watershed Committee and Springfield-Greene County Park Board. Like McDaniel Lake, Valley Water Mill supplies the City of Springfield with drinking water, so no wading, swimming or boating is allowed. Shoreline fishing is allowed, and you can catch mainly bass, bluegill and channel catfish here, and occasionally a crappie or two. The parking lot is open from dawn until dusk, year-round, and a trail takes off from there around the 13-acre lake. Call the Park Board at 417-864-1049 for more info. When we ask 417 readers to name their favorite weekend getaway, Table Rock Lake and Eureka Springs, Arkansas, often compete for the top spot. So we thought, can you do both in the same weekend? Is it possible to travel by boat from the docks of Kimberling City to the winding streets and hillside shops and restaurants of Eureka Springs? The answer is yes, almost. We started our lake and land weekend in Kimberling City on a Friday morning with friends Ken and Teresa Schwab. Ken pointed us west, and we meandered southwest toward Holiday Island Marina, just across the Arkansas-Missouri border. By water, the trip is 40 miles. At a cruising speed of 20 miles per hour, we were pulling into Holiday Island by 10:30 am. From the Marina, downtown Eureka is less than a 5-mile cab ride. Veterans of this “Eureka Springs by water” journey had given us the cell number of a taxi driver named Fuzzy. Shortly after we paid the marina manager for a night of dock space and secured the boat, we rolled our luggage to the parking lot and climbed in Fuzzy’s taxi. Friends with a sense of humor said he would pick us up in a limo, which turned out to be a “vintage” station wagon. The only thing rougher and louder than the ride to town was Fuzzy’s non-stop tirade about double-crossing titans of business and the double-talking local politicians who coddle them. It was like listening to angry talk radio, without the radio, and twice as entertaining. A Harley-Davidson rally in Fayetteville had spilled over to nearly fill all B&B and hotel vacancies in Eureka Springs, but we were able to snag the last two rooms in the Basin Park Hotel on Spring Street. Built in 1905, it has an Old World feel and furnishings, a full-service spa on the second floor and an open-air atrium perfect for a wine and cheese interlude from sight-seeing. Rooms are a bit sparse, but hey, in 1905 this was the lap of luxury. After leaving our bags, we walked a few blocks to Local Flavor Café on Main Street for lunch. Weather was ideal for eating street-side, so they tucked us into a table on the patio surrounded by live plants, quirky art and trickling springs. The four of us sampled crab cakes and smoked salmon appetizers, and Reuben and chicken pesto sandwiches. Chardonnay all around. Despite the constant roar of motorcycles, the sunny boat ride, al fresco dining and wine left us in a mellow mood. For the afternoon, Eureka Springs publicist Carrie Groves arranged a tour of the Queen Anne Mansion with gracious owners Lata and Steve Lovell. This 1891 American Queen Anne style home was relocated to Eureka Springs from Carthage, Missouri, and is appointed with museum-quality 19th-century furnishings. Famous houseguests have included Buffalo Bill Cody and writer Harold Bell Wright, best-selling author of Shepherd of the Hills. In addition to tours, the home can be rented for private parties, corporate retreats and weddings. We enjoyed a delicious glass of wine with Steve and Lata in the gazebo at the back of the property before moving on to our next destination. As the sun set and the motorcyclists roared back to Fayetteville, we spruced up for our dinner at the Grand Taverne, the French-influenced restaurant in the lobby of the Grand Central Hotel. Chef Dave Gilderson, who once dazzled diners at Branson’s Candlestick Inn, is adding to his reputation with servings of fresh bread and made-from-scratch dishes that feature herbs from his balcony garden. Our foursome shared scallops and tuna carpaccio to start, with duck and beef dishes for entrées. Maybe the only thing better than the food is the mood-enhancing piano music from Jerry Yester. An appropriate end to the first day of our Eureka-by-boat adventure. We departed the Basin Park and jump-started our Saturday by walking down a flight of stairs off Main Street into a building erected in 1888, home of the Mud Street Café. It’s a full-service restaurant, built around a turn of the century oak bar with beveled mirrors. But mornings are for their award-winning coffee and espresso drinks, topped only by their omelets (I recommend the Greek), sour cream pancakes or fresh muffins. When we visited, the pumpkin-pecan and pear-walnut versions were being shared. Full of caffeine and a hearty breakfast, we spent the rest of the morning strolling the streets, shopping the stores and gawking at the bikers and their babes. This Harley rally was as much costume ball as motorcycle event, with outlandish leather and denim outfits designed as fashion camouflage for the beyond-middle-age crowd that was proudly wearing bad-boy biker personas for the weekend. Along with fashionable boutiques that line Spring Street are more than a dozen folk and fine art galleries, giving every Eureka Springs weekend an experience similar to Springfield’s First Friday Art Walks. Lunch was at DeVito’s, a casual but sophisticated Italian restaurant owned and operated by Chef James DeVito. Travel writers from the New York Times and Frommer’s Guide have called it Eureka Springs’ best Italian restaurant. We sampled the salads, then shared a spaghetti and ravioli platter. I’m looking forward to visiting this place again this summer to take advantage of “Sky-Dining” on a new outdoor patio 60 feet above Main Street with a view of East Mountain and the Grand Central Hotel and partial views of the Basin Park and Flatiron buildings. The afternoon was spent returning to the shops and galleries we had visited in the morning, where our browsing turned to buying. Ken and I thought we’d never pry the girls out of Christopher’s, a clothing boutique that had them captivated. When they reached the limit of how many shopping bags and boxes we could cram into Fuzzy’s cab and onto the boat, we began our return trip from the Holiday Island Marina to our home port in Kimberling City. The return trip took about 30 minutes longer, thanks to some bad map-reading and direction-giving on my part. With the price of marine gas, you don’t want to make unnecessary U-turns. And I would never try this trip at night. But, I will definitely strive to make this trip an annual tradition.